We don’t always meal prep. But when we do, it’s usually back-to-school season. The days get busier, kids get hangrier, and dinners with family become even more precious. To make it through the crazy days ahead, arm yourself with these weeknight meals and quick tips … even when you’re short on time. 1) ONE MEAL. ENDLESS POSSIBILITIES. We’re big fans of recipes that adapt. Change out the vegetables, switch the meat, and you’ve got a totally different dish … even though the basic preparation method remains the same. For a meal you can make over and over without tiring out your tastebuds, add a phyllo flatbread to your skillset. They go from oven to table in minutes and can take on any toppings. Try a white pizza one week, and then go for a barbecue chicken style the next. 2) MAKE IT AHEAD … OR BUY IT ALREADY MADE. Short on time? Dishes that come together quickly are a busy cook’s best friend. 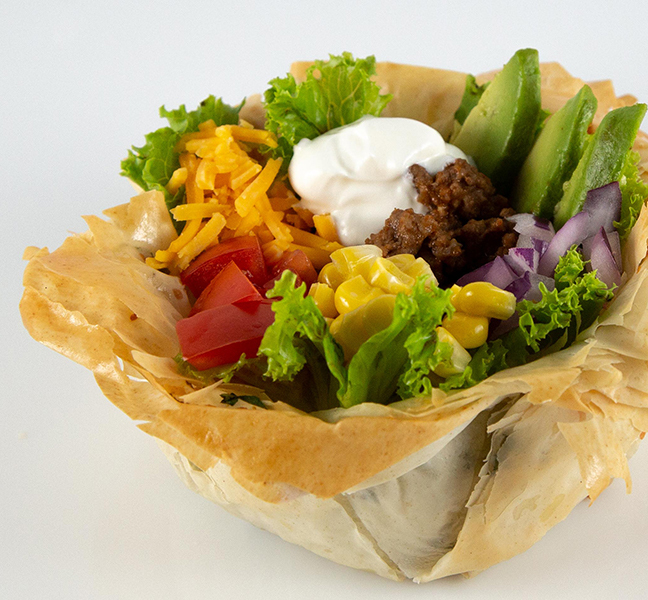 Our zesty taco bowls are as fast as they are flavorful. The phyllo bowls can be baked the night before, and then filled with shredded rotisserie chicken, salsa, canned beans, pre-made guac or whatever else your heart desires. 3) GIVE IT SOME CRUNCH. Casseroles hold up well in the freezer, make gigantic portions, and give parents a way to sneak vegetables into a gooey pan of goodness. So, what’s better than a casserole? A casserole topped with a crispy phyllo crown. It’s all about texture, and our phyllo topper delivers. Try it over mashed sweet potatoes, or as an alternative to fried onions in your fave green bean casserole. 4) TAKE A BREAK FROM STEAK. We’re all about a Meatless Monday. Or Tuesday. Or Thursday. No matter where it falls in your schedule, an all veggie meal is the perfect way to lighten up your weekly menu. For a savory dish that will satisfy the most meat-and-potato-iest of eaters, try this hearty butternut squash and ricotta pie. After a long week, you deserve dessert. Make your sweet tooth a happy tooth with Nutella and coconut mini tarts. Swirl together Nutella, cream cheese, and toasted coconut for an indulgent little bite that you don’t have to share. With these ideas, you can sail through the week with five nights of tasty dinners that come together in a snap. For even more mealtime inspo, visit our Pinterest board for healthy entree recipes, and sign up for our newsletter!